Schwarzkopf OSiS+ Volume Up. 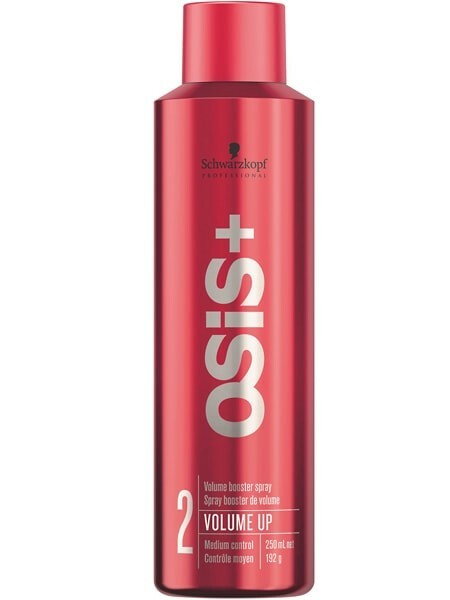 Get moveable, touchable volume with the Schwarzkopf Professional Osis+ Volume Up spray. Designed to provide strong but natural-looking body, the breakthrough formula immediately boosts the hair with incredible volume. Innovative Flex-Web technology envelops the hair in a weightless, flexible polymer web for effortless bounce with added texture that can be reactivated throughout the day. The medium hold formula amps up the hair and makes sure it stays there, providing volume at the roots and throughout the lengths without weight or stiffness. It’s your hair, only more fabulous. Spray through dry hair in short bursts and style. OSiS+ Volume Up makes volume hair.